And it was also hot outside so I didn’t want to cook it in the oven, like I should have. Took them in the house, gave them a rinse, then popped the herbs into the pan I’d browned the chicken in, just wanted to get the herby oils released from the leaves and then added some of my Home Made Chicken Stock, about 2 cups worth. I really liked the taste, especially since I sautéed some frozen veggies with some leftover rice for my side dish. It was a little too herby for my DH’s taste, but I noticed he ate all the breast meat anyway. I like to astound, mystify and generally amaze people by my casualness about cooking a Prime Rib Roast. (Y’all know I’m kidding, right?) So many people get totally intimidated by this cut of meat and while I can somewhat sympathize, I don’t really understand it totally. If anything, this is one of the easiest cuts of meat to cook. The problem lies in the fact that it’s really pretty pricey and that is scary in and of itself. But if you find it on sale, and try to cook one, I think you would be surprised at how easy it can be to cook one. Roast resting on some celery stalks and with mushrooms nestled beside it. If you’ve ever cooked a roast, you can make a Prime Rib Roast, it really is that simple. 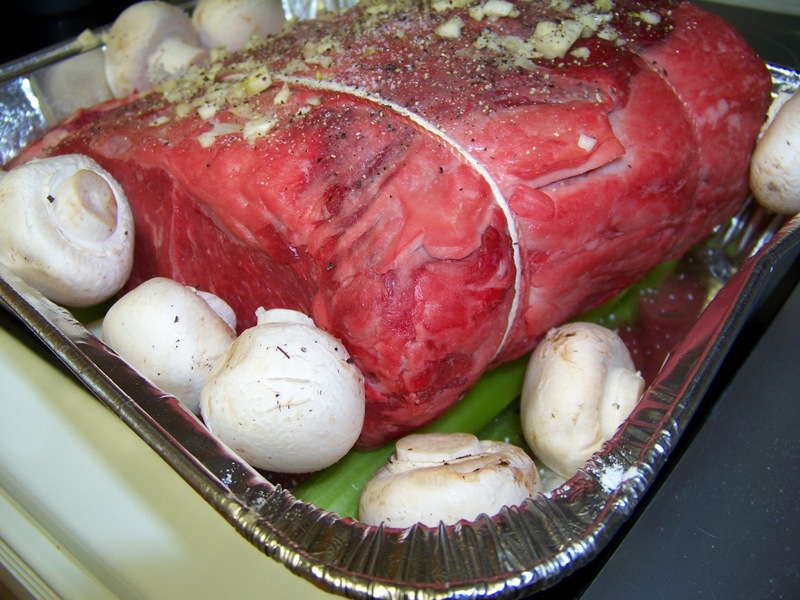 I still don’t know if I was fearless or stupid or … but the first time I cooked a Prime Rib Roast I cooked a 16 pound one. And guess what? It was fine. In fact it was downright good. And what made it even better, we ate it while we were camping out in the woods. Just something about cutting into a big old hunk of meat, way out in the backwoods. (sorry to any vegetarians who are reading this). It was primitive and good, or is that good and primitive? And it also made quite an impression on my fellow campers. And when a local store happened to have a killer sale on the roasts a while later, I did it again,only this time I cooked two of those roasts, again while camping. In fact for years, that’s the only time I made Rib Roasts. While we were camping. And then watched everyone fighting over the rib bones that were left. I’m not talkin’ about the dogs either, sigh, what grown men will do when faced with something like a big ol’ meaty bone. Gets that primitive streak going, I tell ya. At any rate, over the years I’ve refined and refined my technique and I think I finally have it almost perfect, at least til the next time when I make it a little different tweak it some more. There are a few basic rules that I always follow. 1) Pick the most appetizing piece of meat that you can, if the butcher is impatient with you, tough, it’s your money. I don’t like a ridge of fat running through the middle of the roast, and have rejected a lot like that. For my taste, it makes the meat too greasy. Take a look at both ends of the roast. And my own personal preference, I don’t like the meat cut from the bone. (unlike the picture above, it was the best looking roast I could find that day) While it may make the meat easy to carve, it also loses a lot of juice and I don’t think the meat is as tender. 2) Take it out of the fridge for at least 2 (two) hours before cooking, to warm up a little, it cooks so much more evenly when it’s close to room temperature. 3) I forgive myself if it isn’t perfect. Life happens. 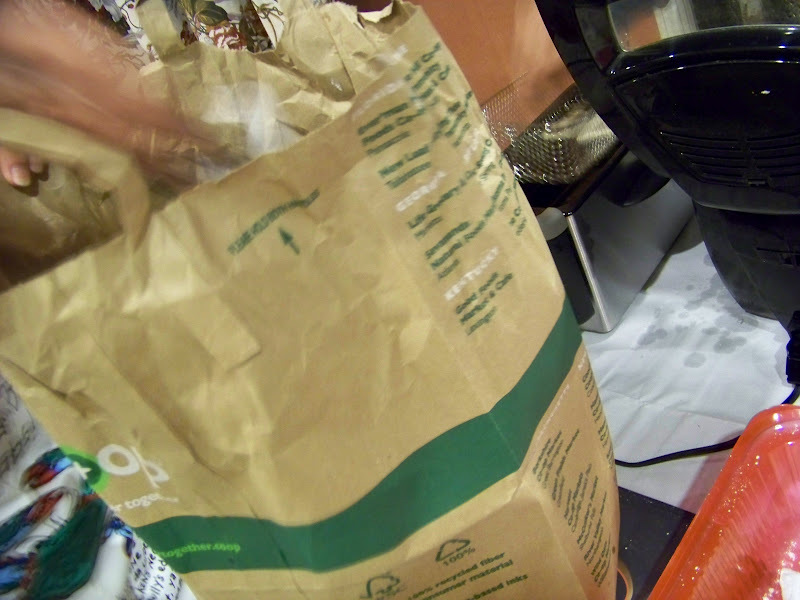 5) Make sure you buy a roast that’s big enough. I usually figure on 1.5 lbs per person. YUP, 1 1/2 lbs per person. That is, if you’re cooking a roast with ribs. The rule of thumb for most people is that you get two servings of meat per rib. So if you have a 4 rib roast, you have 8 servings of meat. You can Google all the sites you like and they’ll pretty much tell you the same thing. But, they just don’t know my family. Some of the members like the ” OH MY GAWD” cut, which is a little bit larger than life. Trust me, I’ve seen them consume it and look for more later. My BIL could make a decent dent in a roast, as does my DH. I made a two rib roast the other day, and didn’t have much left over. I like having leftovers, so I will cook a roast just a little bit bigger than I think I need. But I don’t always get them. Since this post is getting a little long, I’ll close for now and detail how to make the perfect roast in the next post. 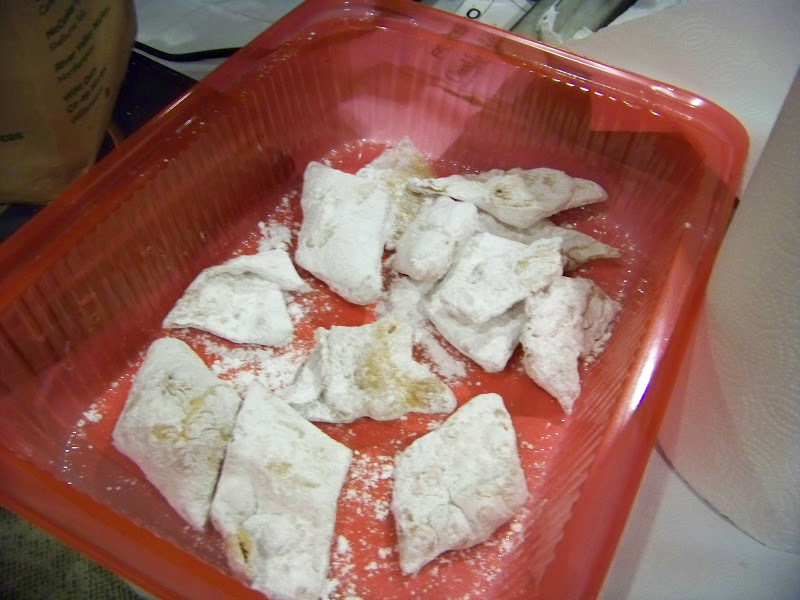 I’ve breaded fish and chicken doing this but have to admit to never doing some thing like Beignets. 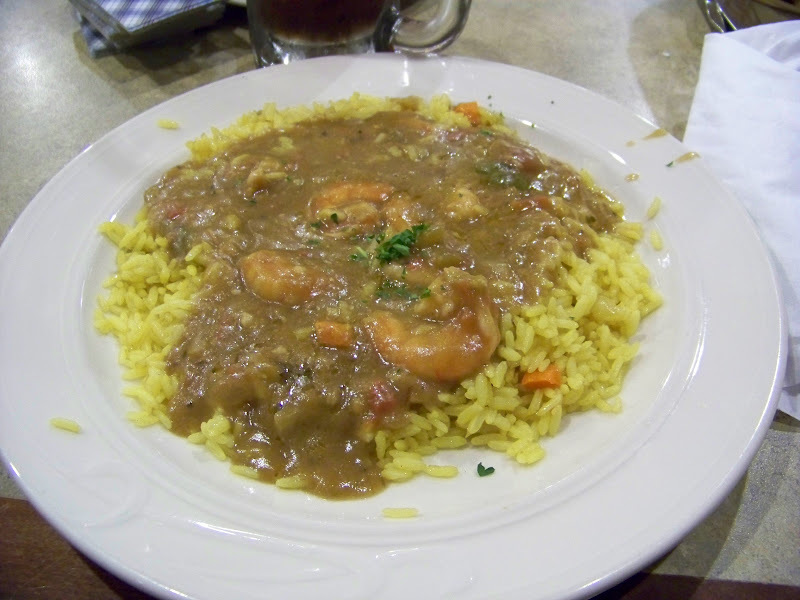 Here’s Ivanhoe’s recipe for the Shrimp Etouffee, and pardon me Ivanhoe, but I added a few details to clarify the recipe instructions. 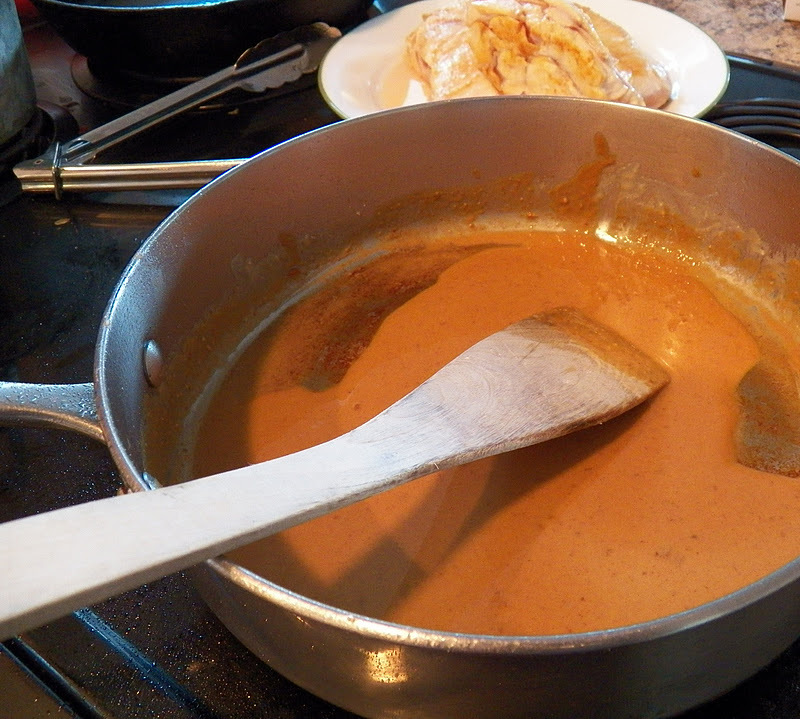 Make a roux with 1/4 cup oil and 1/2 cup flour and stir, stir, stir over medium low heat in a heavy bottomed saucepan until it is a nice deep brown and gives off a nutty aroma. 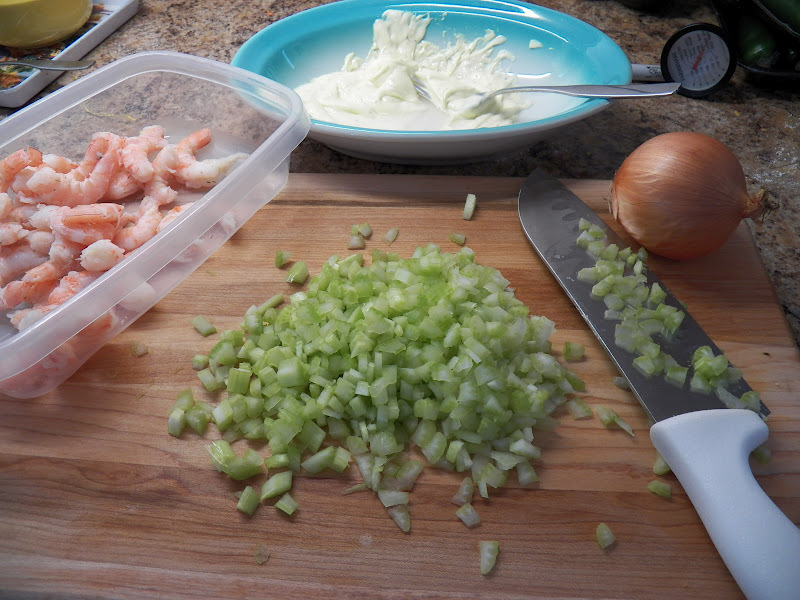 To the roux add the chopped onions, garlic, celery and green pepper. 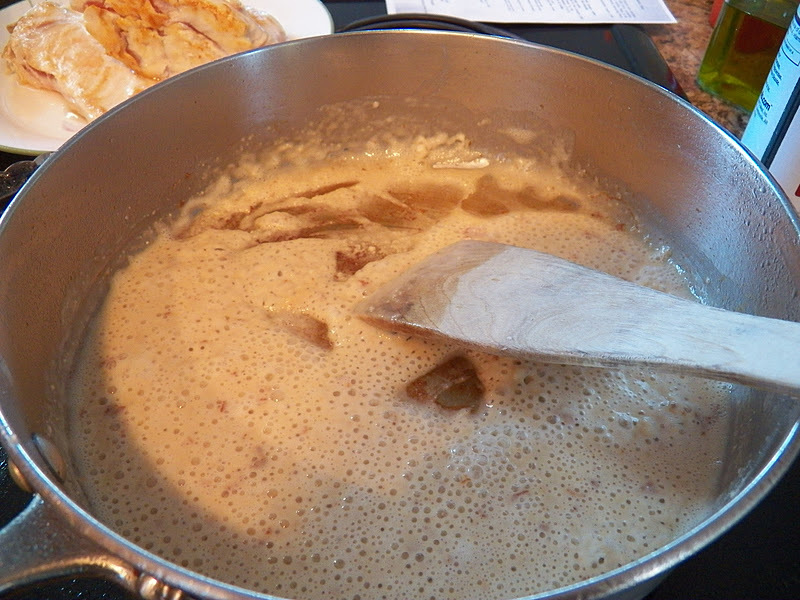 Cook an additional 5 minutes or so and then add the chicken broth, whisking well to incorporate the liquid. This will thicken quite nicely. Add liquid until it gets to the consistency you prefer. 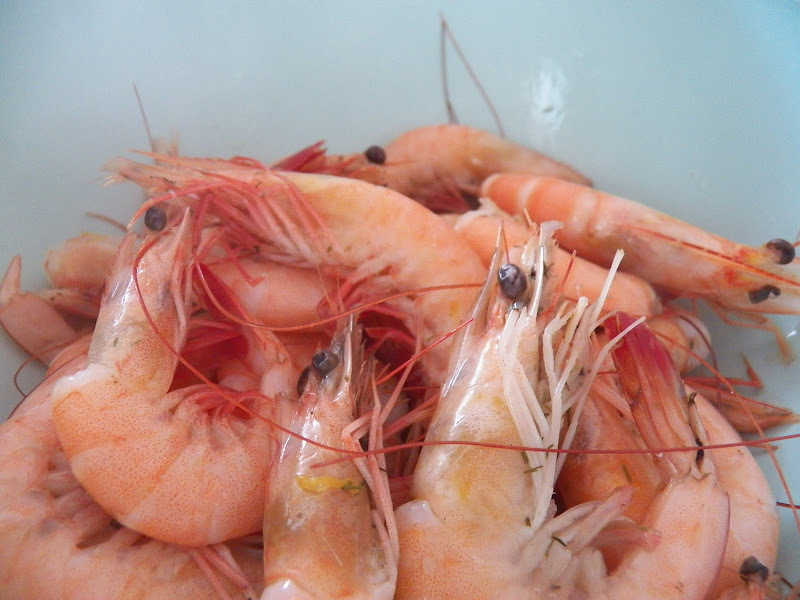 Meanwhile, take the crawfish or shrimp and put in a microwave safe bowl, sprinkled liberally with the Tony’s seasoning and then put 2 tablespoons of butter on top and microwave on high 3-5 minutes. Take out of microwave and add to the pot. Stir well, let it simmer 10 minutes, then sprinkle a couple dustings of paprika on top. Mix well and simmer 10 more minutes. Taste and add Tony’s seasoning and salt to taste. (I might add here, if you use salted chicken broth, you might not need additional salt). 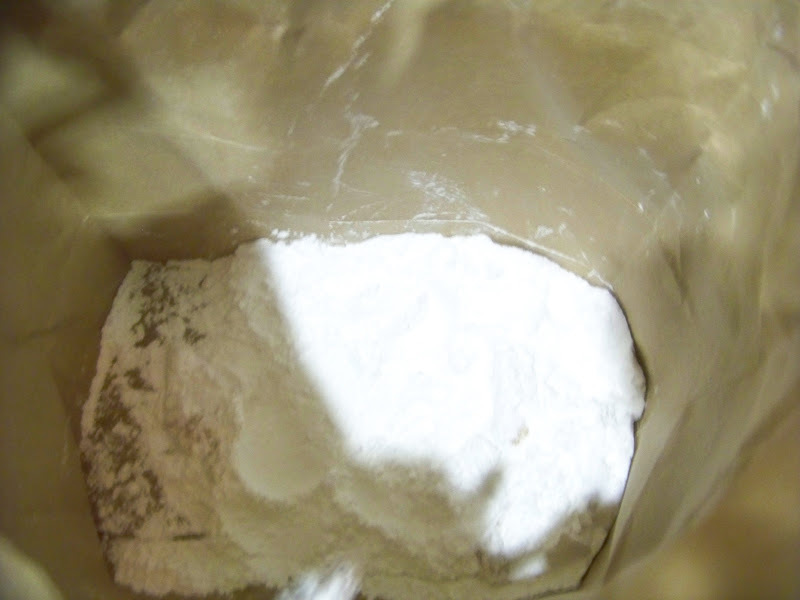 If it’s too thick, add a little more liquid, if too thin, whisk in some flour and water. I keep referring to my home-made Chicken Stock, and realized that not everyone makes their own, but I do, so I wanted to share my process. For me it’s an easy to do thing, and I always try to have a couple of containers of stock in my freezer, they come in so handy. And if the freezer is getting a little ‘small’ cause of all the stuff I’ve frozen, I just make the stock a little more concentrated. Wait a minute, I should do that anyway, it makes more sense, less space, more stock, a win win situation. The absolute best base for stock is an old laying hen or rooster, but these days, we just don’t have access to old chickens, so we have to buy chickens from the store. 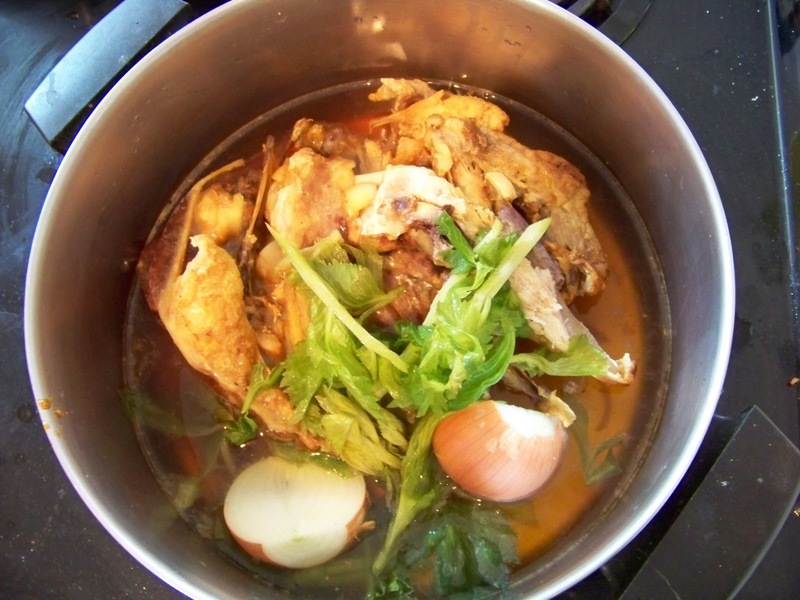 I make chicken stock year round, in the summer it goes into the crock pot, and in the fall or during colder weather, I do it on my kitchen stove. And I make chicken stock when I’ve got all the ingredients together. 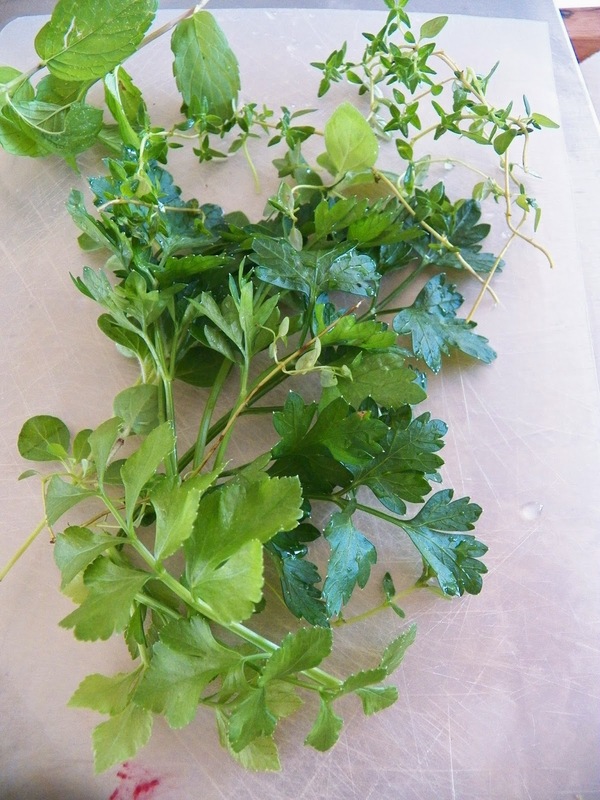 I save the celery leaves from the celery I buy, they freeze well, so I don’t need to go out and buy celery. I halve and stem the onions, just wash them really well, but don’t bother peeling the onion. 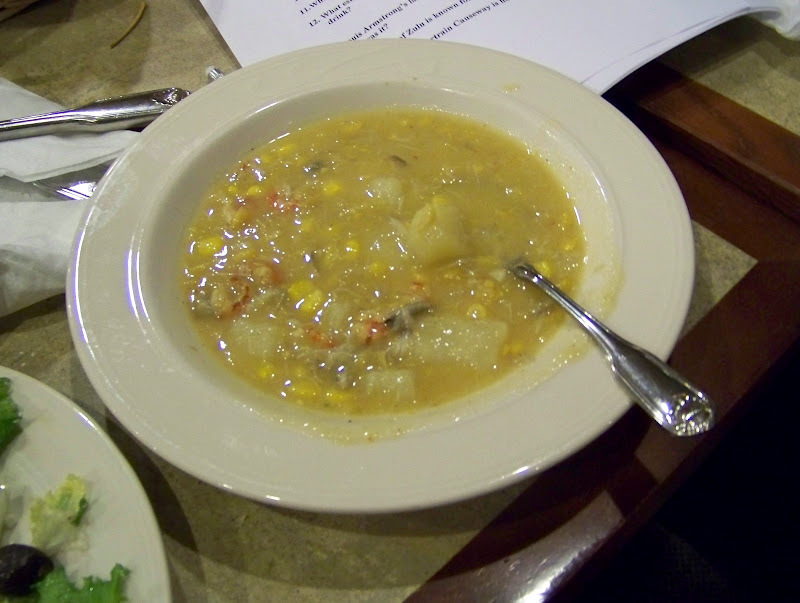 You wouldn’t believe the nice golden color the peels impart to the soup. And I always have carrots on hand. You don’t need to peel them either, (but I do), just cut them in half and dump them in. Last but not least, chicken bones. 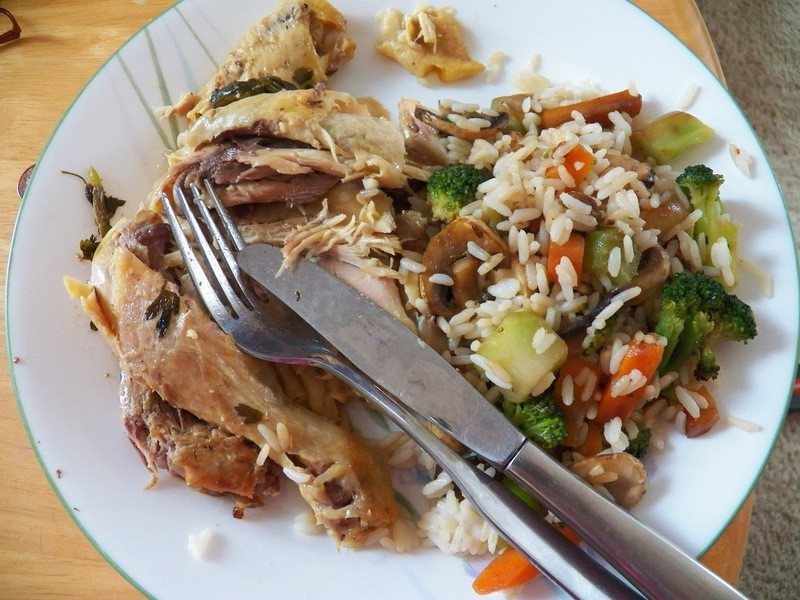 You can save the carcass from a roast chicken, a rotisserie chicken, or the leftovers from the fried chicken you made the last week. Any leftover bones are fair game in my house. If you make Chicken Wings, save the tips, and use those. A couple of weeks ago I made a chicken dish and since chicken breasts were on sale for .99/lb. I grabbed a large package. 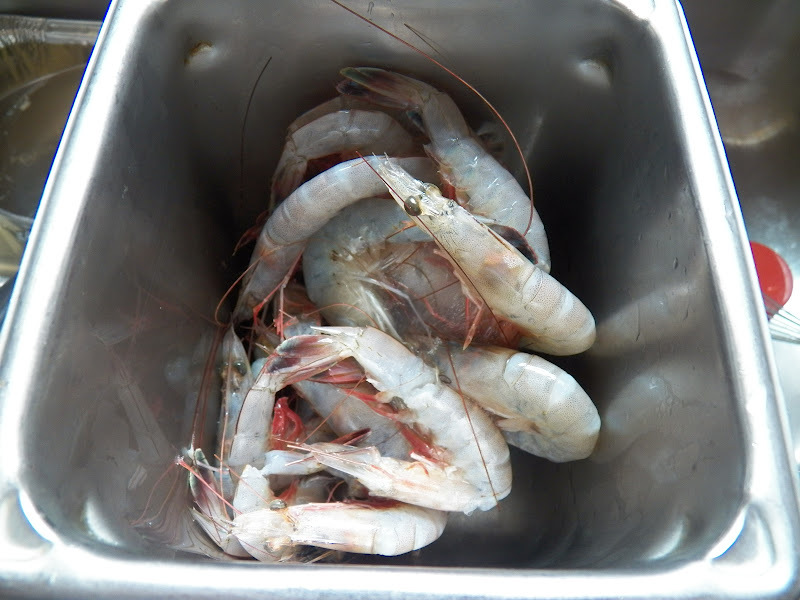 It meant I had to bone them out for my dish, but that’s easy and just takes seconds to do. And I ended up with the bones from several breasts. So I threw them in the oven and baked them til they were a nice golden brown. Because I didn’t have time to make chicken stock that day, I just bagged them and chucked them into the freezer. Salt and Pepper to taste, at the end. Now here’s where the fun begins. 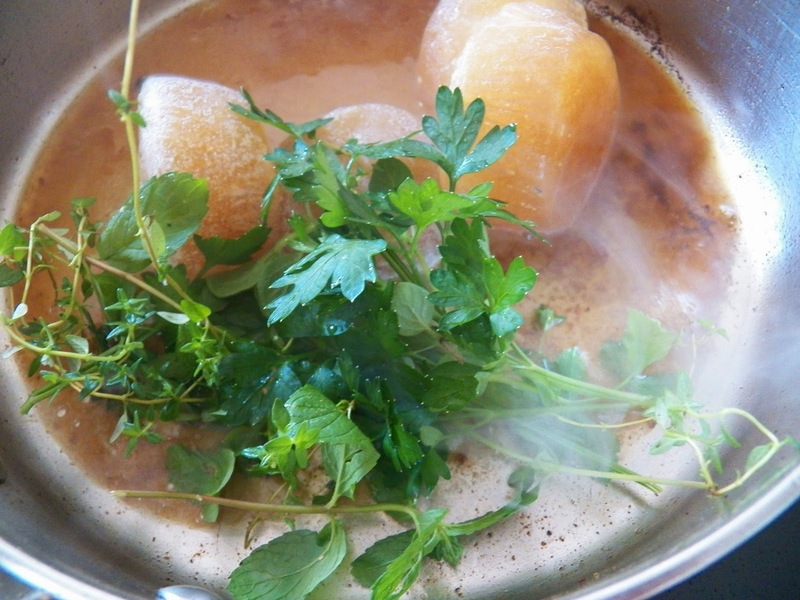 You can add several layers of flavor to the stock with some of the following: Saute the onions, celery and carrots in a little olive oil before adding them to the stock. 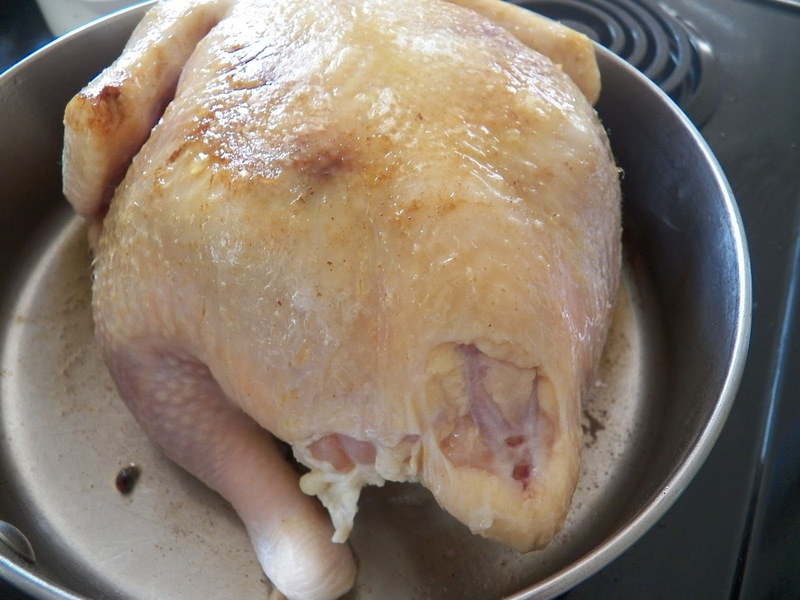 Or roast them in the oven and let them brown a little before adding to the chicken bones. Brown the chicken bones and then add them to the veggies, doesn’t matter, it’s all good. Most important, let it simmer for a long, long time. I didn’t add salt or pepper until the end, I wanted to taste the stock, and then I only add the least amount of salt and pepper. And then I simmer it and simmer it and simmer it. OK, so I just simmer it on the stove top for about 3 hours, with the lid on for the first 2 hours. The last hour is the one I use to help concentrate all that chicken goodness. I take the lid off and watch it. And I want to stress this again, don’t dump in all the salt and pepper in the beginning, if you reduce the broth, you won’t reduce the salt, you’ll just concentrate it. This batch is lovely and browned from the chicken bones I browned first, and it’s simmered long enough that I’ve managed to reduce the 8 cups of water to two ice-cube trays full of stock. 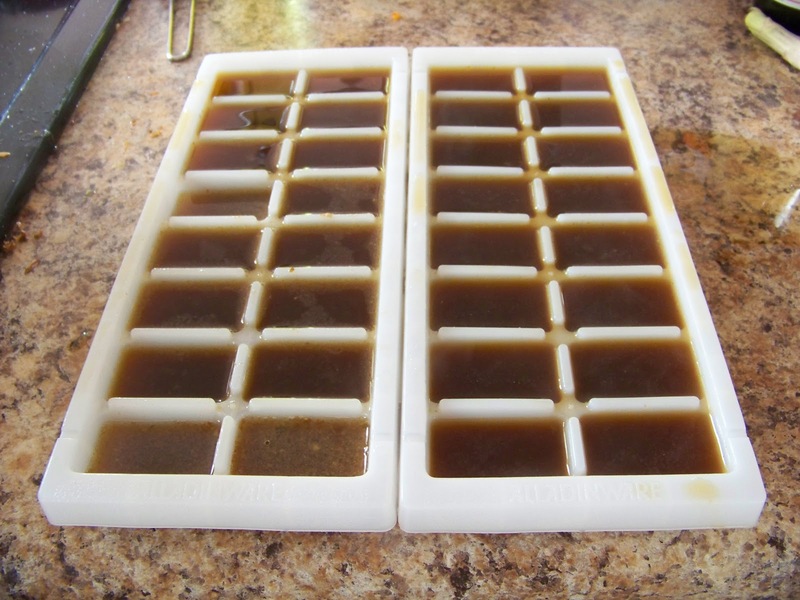 I put it into ice-cube trays and will use it to flavour gravies, just plop a nice concentrated cube into the gravy and VOILA!, instant flavour. So now you know how I spent part of my day. I can now go to the freezer (as soon as these freeze), take out a cube or two and throw it into some gravy, or some soup to oomph it up a little. Whenever I like and it will be all good. 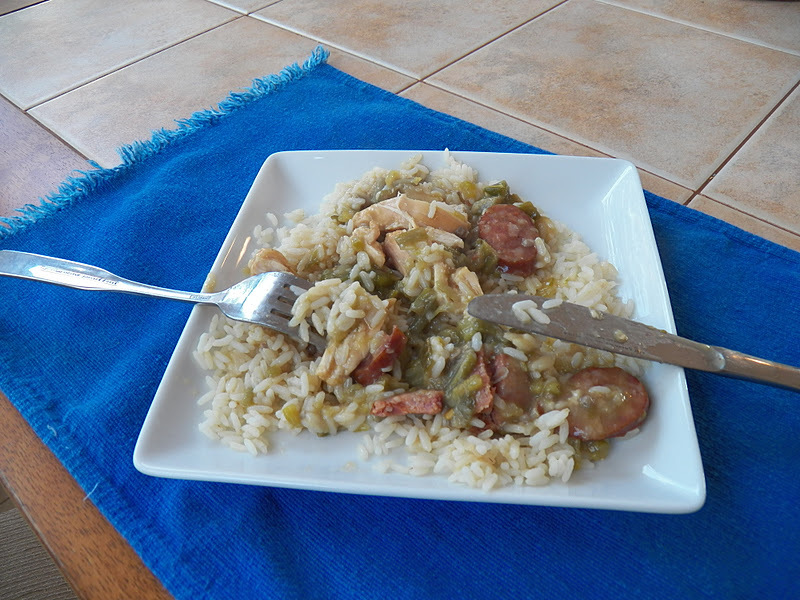 I love Gumbo anyway, but have to admit I’ve never made it from scratch, well, I now have a new recipe in my arsenal. 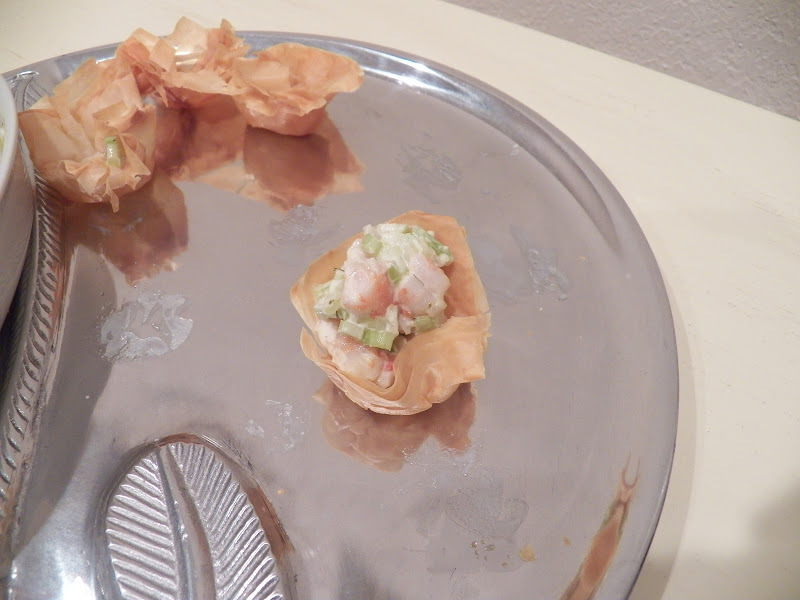 In fact, I made it the other day for dinner. I did make a few minor changes to the original recipe, but hey, I’m the cook. And don’t you forget it! Sorry, I got carried away there. I didn’t cook as much chicken as the recipe called for, but I did use the full amount of vegetables. Veggies are good for you, aren’t they? And this is more a note to myself, that when I put chicken stock in the freezer, to label it better. 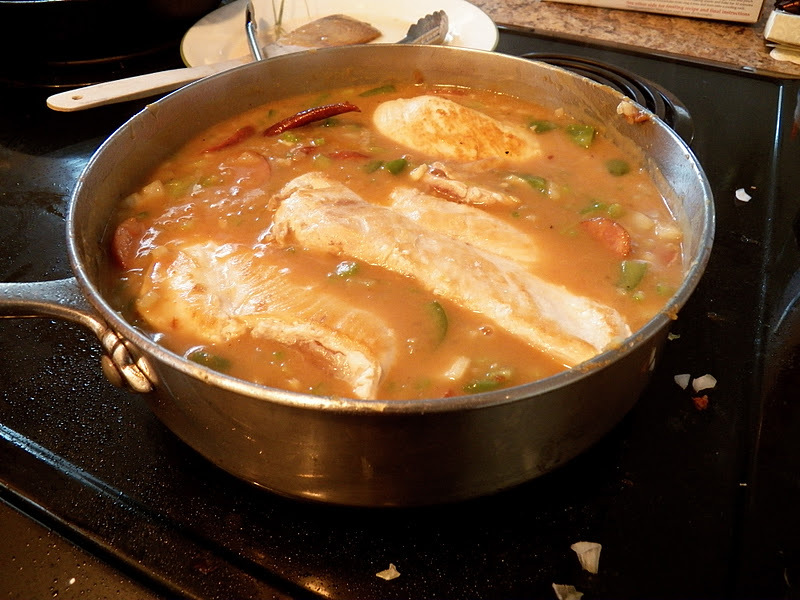 I accidentally put some of my super charged (highly concentrated) stock into the gumbo by mistake, but was able to correct it. 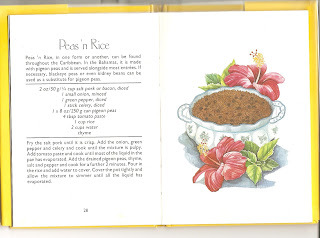 And on the whole, the recipe was good. Next time I make it I will try to use a some red or yellow bell peppers, more for the contrasting color than anything else. I also didn’t make the full recipe of Roux either. 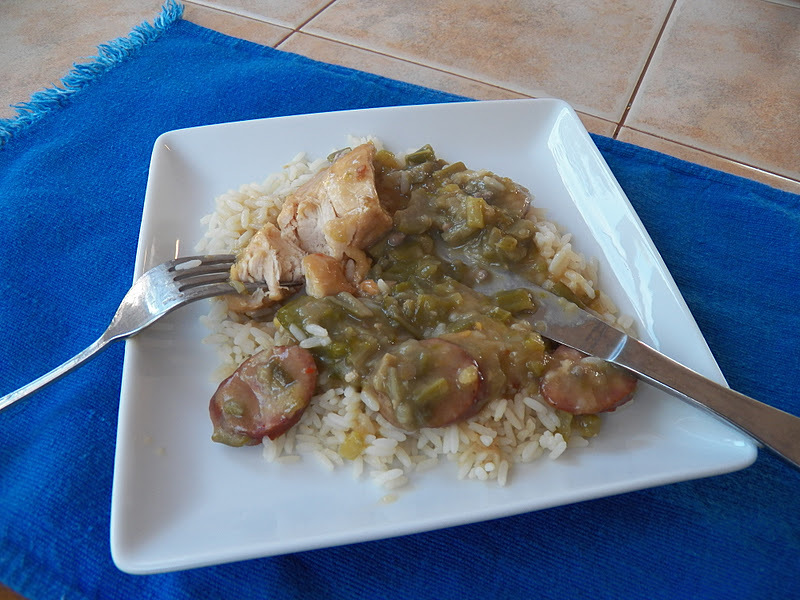 Something about a half cup of oil and a full cup of flour, I thought it would be too much for the three half breasts of chicken and one link of Andouille sausage I used. 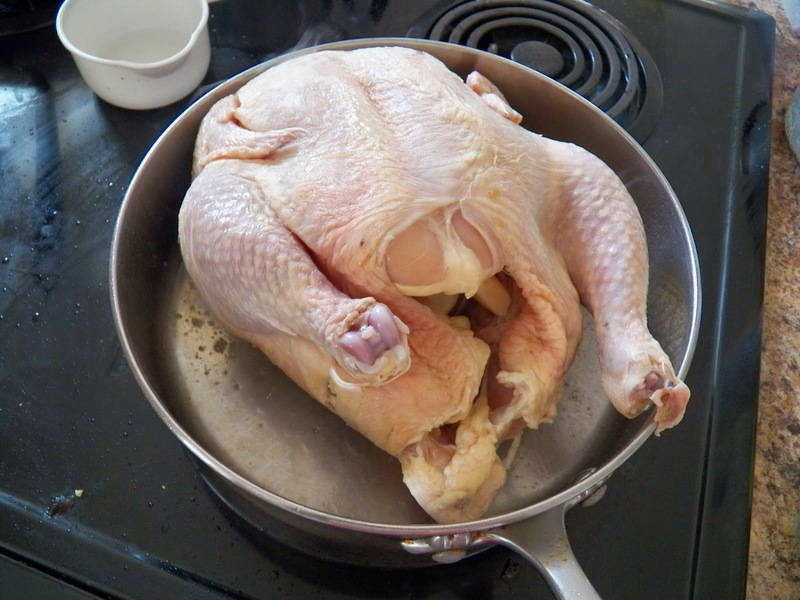 Start with browning the chicken in a little oil, then set the chicken aside while you cook the roux. This will take you a good half hour or so, until it turns a rich dark brown. You need to pay attention, cooking this over a low heat and stirring, and stirring and stirring. I think next time I make this I will use a little butter in with it, just to add another layer of flavour. 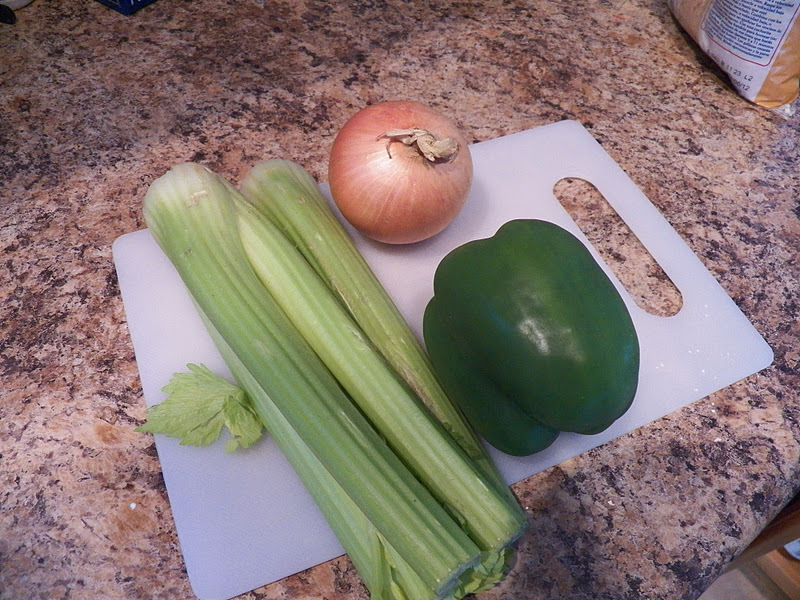 But while it’s cooking you can chop up the vegetables, for that you need three of my fav’s, a green pepper, an onion and celery, or if you’re not into multi-tasking, just chop the veggies first and set them aside. 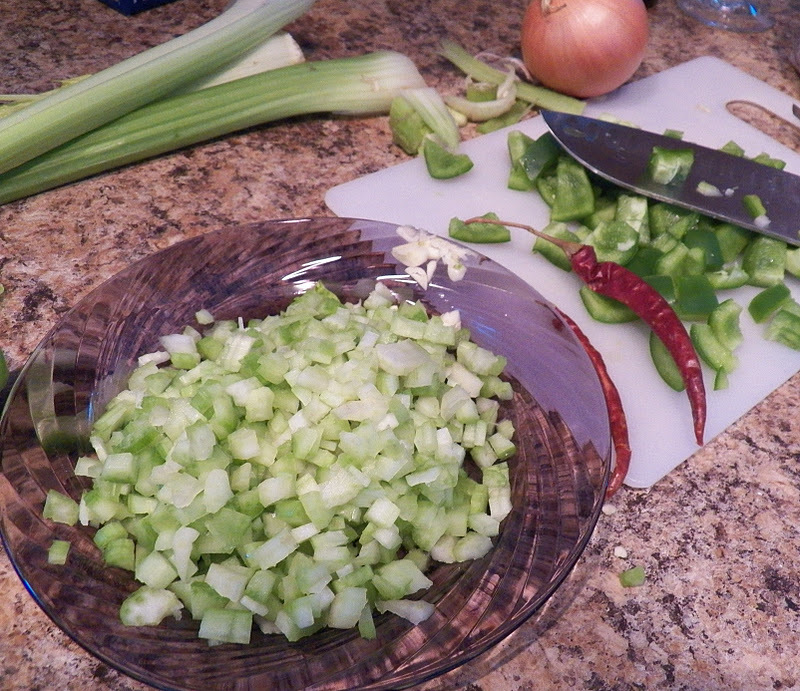 Chop up the celery, and onion quite finely, then rough chop the green pepper, and don’t forget the clove or two or three of garlic. Especially since I forgot to get a picture of that. And then the very important chile pepper. I threw in a couple of Chile de Arbol peppers, but next time, I think I’ll add a couple more. Not too sure where this Danish girl got her love of spice, but I do like me some spicy food. 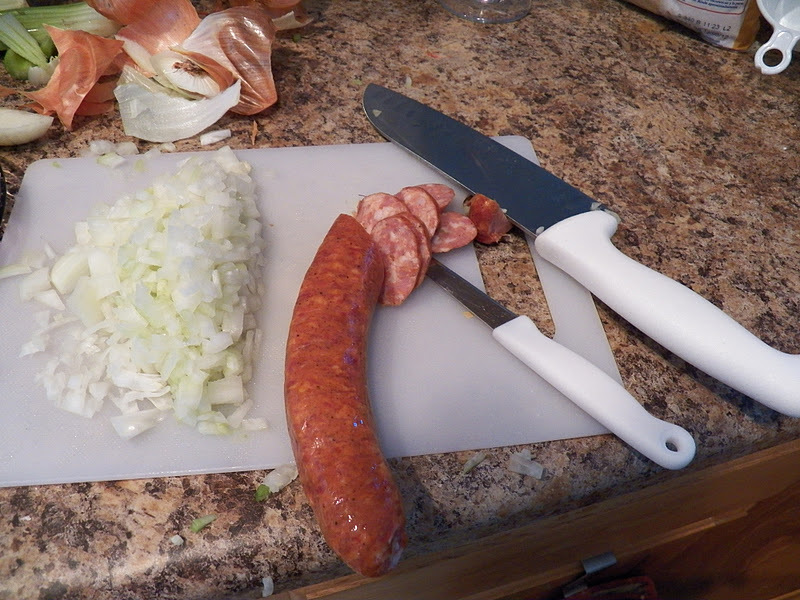 Chop up the onion, mince the garlic and slice the sausage. 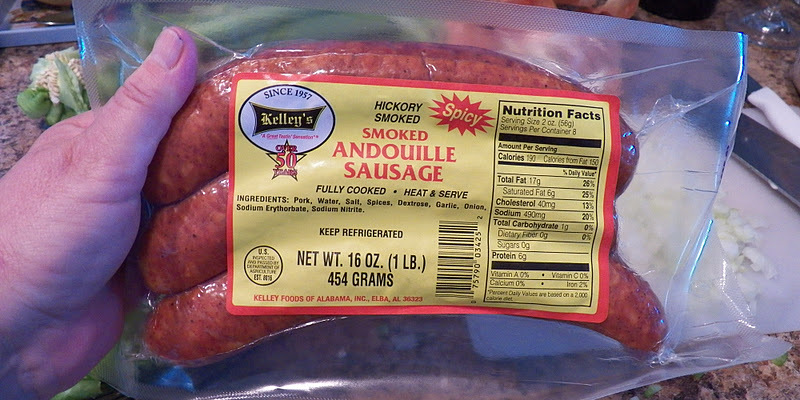 I used one link of the Andouille Sausage here. 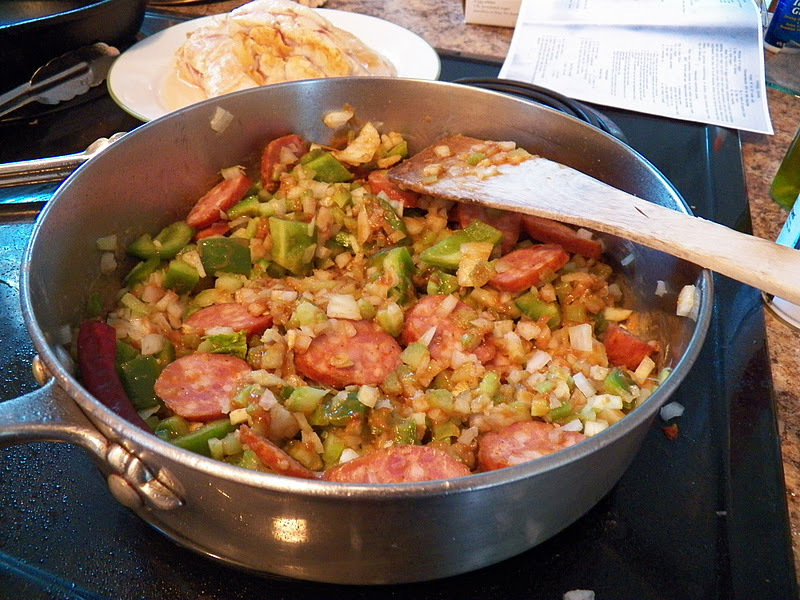 Next, dump the chopped up veggies and sausage into the pan with the roux and stir it around, coating the veggies. It will look a little odd at this point. Pour in the stock while stirring, otherwise it kinda glops together. 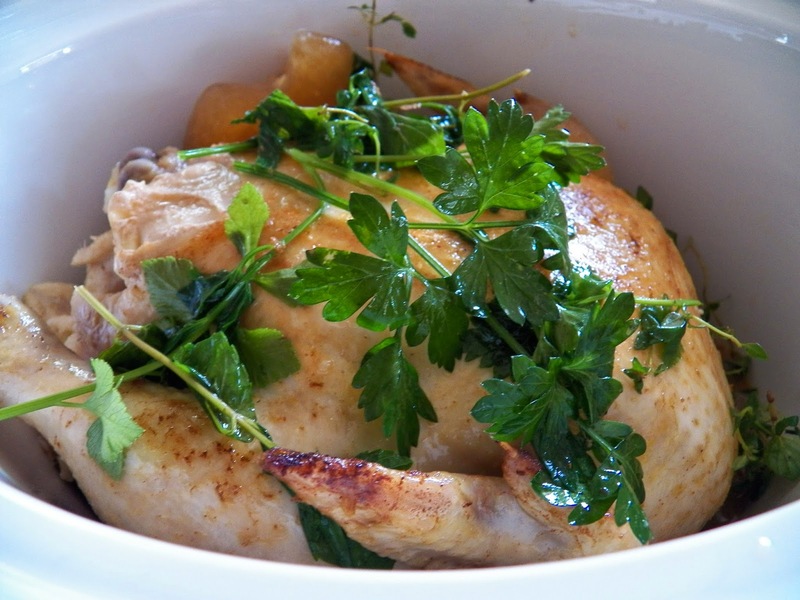 Place the chicken into the veggies and stock, add a bay leaf and let simmer for about 30-45 minutes, or until the chicken and veggies are done. And next time, I’ll cut the chicken into smaller pieces when I serve it. 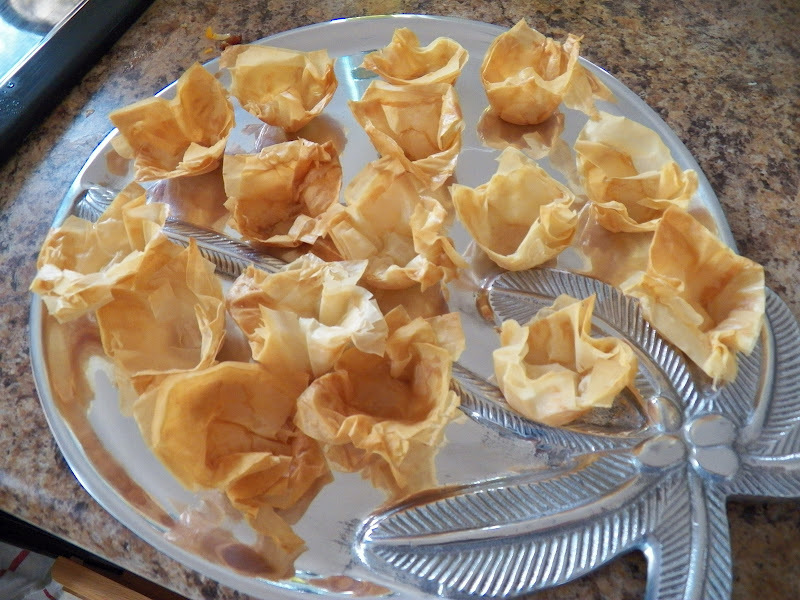 These were a little unwieldy. Even though I’d cut each piece of chicken into three. 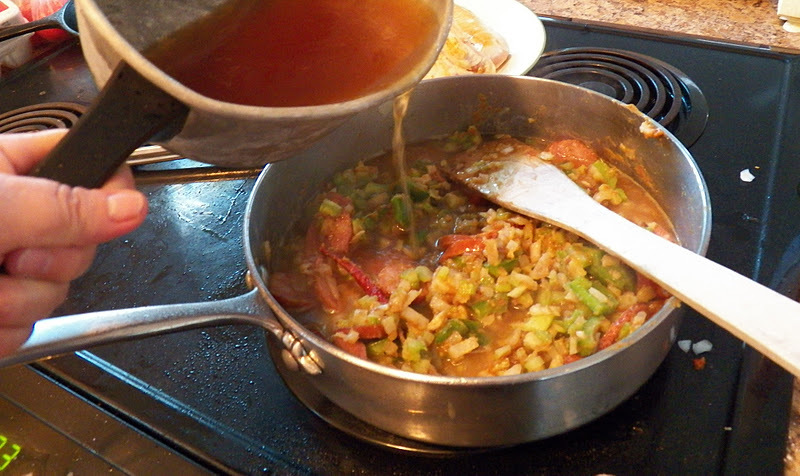 Add either some fresh okra or some canned okra at the end, let that simmer for a few minutes, and then serve over rice. We had enough for dinner and three lunches for me. *giggle*, so I threw the rest into the freezer and now I have lunches. Here is the full recipe. 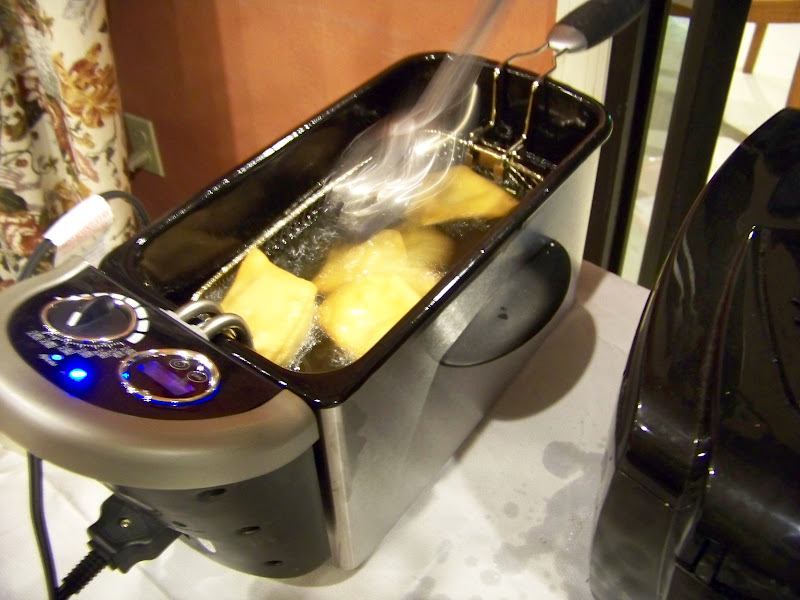 Heat the oil in a large saute’ pan or frying pan and brown the chicken on both sides, 3-4 pieces at a time. 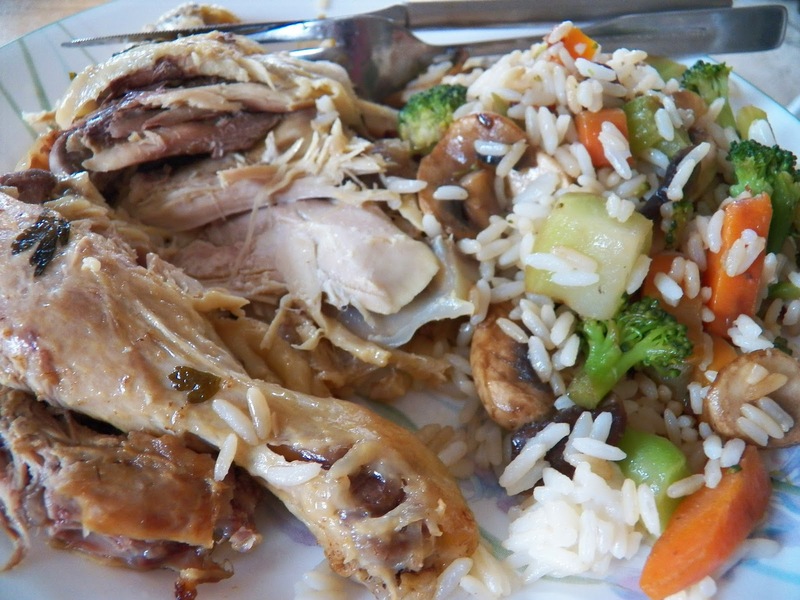 Transfer the chicken to a plate and set it aside. Lower the heat under the pan and add the flour. 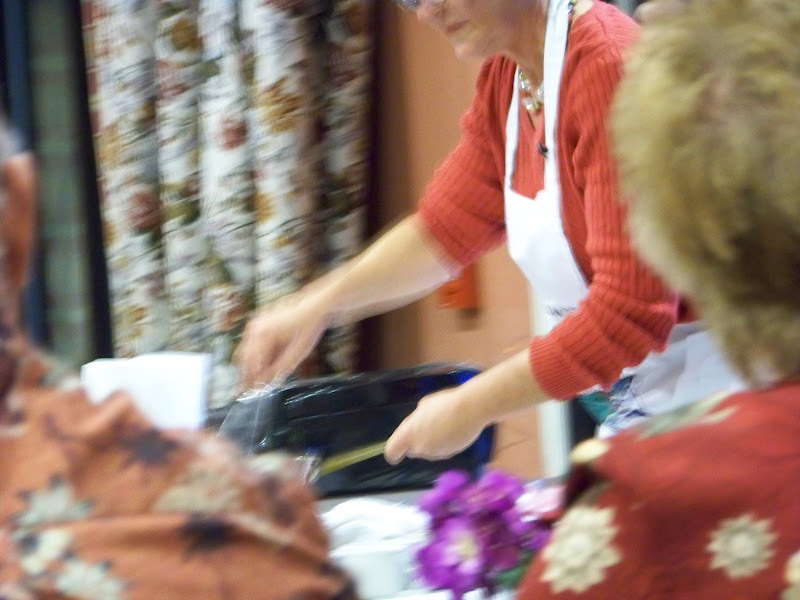 Cook over a very low heat for about 30 minutes, stirring constantly until the flour turns a rich dark brown. 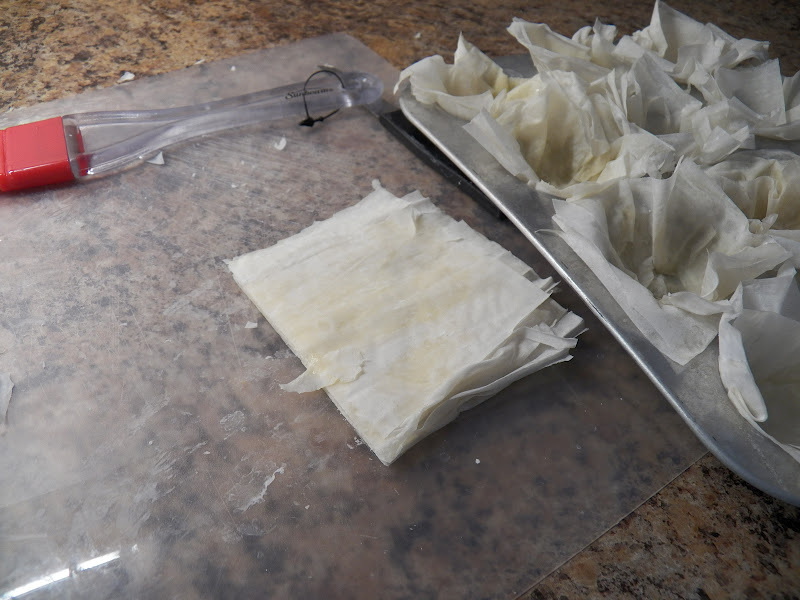 Take the pan off the heat occasionally, so that the flour does not burn. Add the chili peppers, onion, green pepper, sausage and garlic to the roux and cook for about 5 minutes over low heat, stirring continuously. Pour on the stock and stir well. 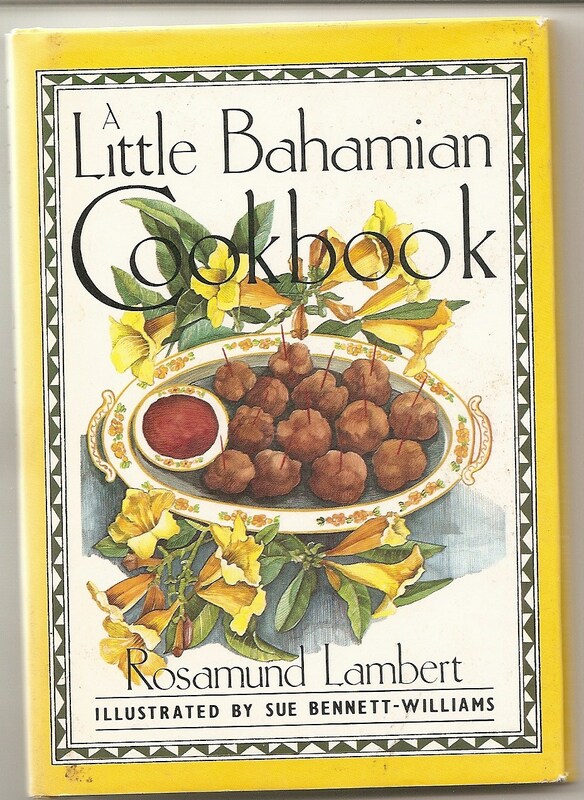 Add the bay leaf and dash of Tabasco if desired, and return the chicken to the pan. Cover and cook for about 30 minutes, or until the chicken is tender. Top and tail the okra if using fresh, and cut each into 2 or 3 pieces, if okra is small, leave whole. Add to the chicken and cook for a further 10-15 minutes. 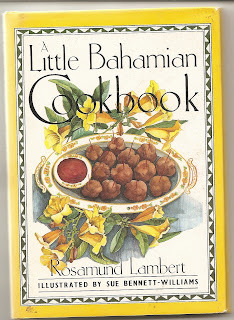 Remove the bay leaf and serve over rice.